I recently got a drumbrute impact and a minibrute 2s and I'm now planing to expand it with some modules. I'm a complete noob and I'd like to make sure if this setup makes any sense at all or I'm getting it completely wrong. I wouldn't get all the modules at once - this modular thing is quite expensive - so I'd buy one at a time starting with the shapeshifter, which I could patch with the minibrute 2s sequencer and VCA. From there I think it makes sense to get more VCAs and envelope generators before getting the erbe-verb, otherwise my patches are going to be very limited. Does this rack make any sense to expand on the minibrute 2s? Yes and no. Like you note, this current build is really limited. I'm presuming you'll be relying solely on the 2S's filter which is...OK, up to a point, but you could try and add something small here. The overall problem you'll be facing in a 3U Rackbrute is space, so going with large widths on your modules is a bad idea. Consider smaller alternatives or, perhaps more sensibly, go with the 6U version which would then open up another 88 hp for additional modules with which you can work in the Rackbrute or use them to alter the 2S's functions. But even then, I still suggest you keep the module sizes small...you want as much functionality as you can get in that tight a cab. I agree with Lugia— I have a MB 2 and a MB 2S and the 3U rack can feel very limiting. (Currently working with one 6u and one 3u rack now.) Perhaps you might want to try a smaller module like Expert Sleepers Disting which would add a lot of functionality. Also echoing the thoughts regarding filter — adding Polaris to my rack made a lot of new sounds possible. Finally, you may find the clock limiting on the 2S. A small clock divider/multiplier is really handy. 4ms makes a quad clock distributor that would allow you to trigger events at different rates. Good luck! I'll consider getting the 6U rack, I think it's the sensible choice just in case I need more space in the future. Regarding the modules sizes, I guess the shapeshifter and the erbe-verb are the guilty ones, can you suggest smaller replacements for them? I've watched a couple of videos about the Expert Sleepers Disting suggested by Laupellim, it seems a very powerful module, however, at this point I'm not sure I would know how to use it or how to patch it with the 2s, there's a lot I still need to learn. Right now I lean towards something that can produce smooth and soft sounds, as the 2s can already pretty harsh. A lot of the key to that, IMHO, would be in your filter selections. You'll want some LPGs (I suggest Make Noise's Optomix) to add that plucked, woody Buchla-oid sound alongside the 2s's Steiner-Parker-derived VCF. For the other, given space and cost, I doubt you could do better than G-Storm's Tonus VCF, a copy of the tried-and-true ARP 4012 "pre-lawsuit" VCF. And in both cases, you get two-input mixers thrown in for good measure, which cuts out some of the need for mixers for your VCOs. As for a replacement for the Shapeshifter, you might consider a pair of Mutable's Plaits...two morphable digital VCOs for less than the other, in 24 hp, still saving you 2 hp for something else. And for reverb, look at Purrtronics' Purrvrrb...a mono-to-stereo digital spring (the classic modular reverb) emulator in 8 hp for only $130, then you can also add a delay like the Chronoblob II for $250, giving you stereo reverb and delay in the same space as the Erbe-verb while coming out over $100 ahead. Hey, thanks a lot for your suggestions Lugia. I've been doing some research on these modules as I didn't know them all. I think getting a pair Plaits is a great idea, and the chronoblob2 is also a fantastic suggestion. Having the delay and reverb in two separete modules makes complete sense, however, I'm not totally sold on the Purrvrrb because it doesn't have any cv and I'd have to tweak it manually. Maybe I don't need the cv as much as I think I do, but I guess I'll make some more research for the reverb module. The filters you suggested are pretty cool too. 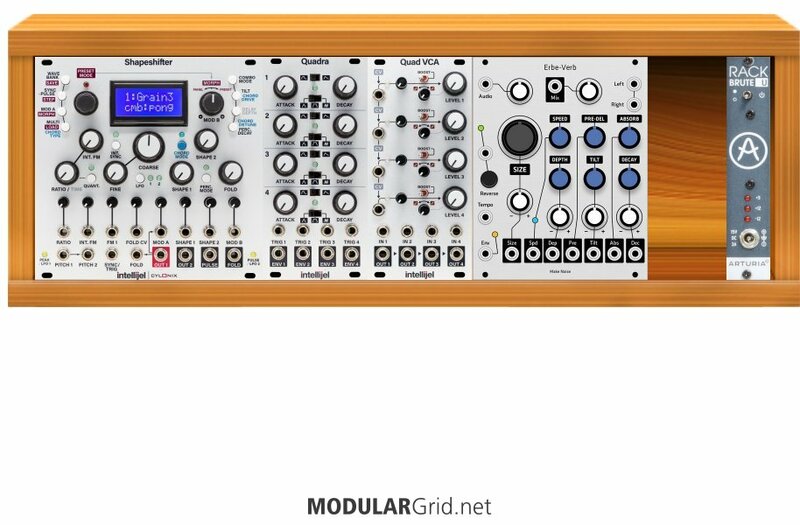 I like the G-Storm's one a lot, but wouldn't an Intellijel Polaris make more sense? It would save 2 hp and provide more filter types. Not sure if the Tonus just sounds better or if the mixer makes it worth the extra 2 hp. I find the Optomix quite interesintg, isn't it like an VCA + VCF? if so, would I still need the Quad VCA at this point? having a couple of Plaits and being able to use the Optomix as an VCA may be enough, or how would I use the Quad VCA in this system? I'm also considering replacing the Quadra with a XAOC Devices Zadar, there's not a lot of difference on the price and the Zadar seems able to provide many more shapes. Complete noob as you see, but really appreciate the help and all the knowledge I'm getting here! Lessee here...as far as the VCF question, the difference is in the circuits. The Polaris is definitely the more complex filter circuit, with the ability to do many sorts of multi-response types, has an OD control, can be configured as a phaser, etc. But you do lose the 2-in mixer. The G-Storm one, though, that's a very old filter circuit, replicating the "pre-lawsuit" ARP 4012 lowpass that was in the original versions of the ARP 2600. Very iconic sound, for one thing...that classic ARP filter pops up all over the place, and I know you've heard it on a lot of tracks from the 1970s. You do make a good point though, particularly if you're still considering the Optomix in the build, since that also has a lowpass VCF in its filter section. But the Optomix isn't really a 1:1 substitute for a pair of VCAs. True, it does have a VCA in there, tandemmed with the VCF, but the Optomix is very much designed for audio. Technically, yes, it can pass DC, which makes it usable for CVs and modulation signal control, but that's sort of a waste of what it's really designed to do. The better thing to use for CV/modulation level control is always going to be a proper DC-coupled linear VCA, hence the need for the Quad VCA, which also allows you to sum CV/mod signals via its mixing capabilities. In fact, you can use the Quad VCA to mix two sources of audio and CV/mod signals at the same time, by taking one output off of OUT 2 and the other off of 4 MIX, and you can alter the VCA response along a continuum between linear (which you'd want to use for CVs and mods) and exponential (better for audio). But wait, there's more! The Optomix (rev. 2016 and fwd) has the ability to process a sidechain signal to allow some rudimentary compression to the audio signal. And that's something the Quad VCA can't do. In the end, yeah, both are preferable, and the use of the Optomix for your final subtractive VCF(s) would enable the use of the Polaris with some more complexity, such as LPGing separate Polaris outputs differently to create a rapid timbral "morph" by feeding the outputs to two different LPGs, then using differing envelope curves to "strike" the LPGs. Zadar...yep, good idea there, long as you don't object to a little menu-diving. That would give you four envelopes that can be more complex than just the two (or three) stage Quadra ones, plus you wouldn't need an expander for looping and/or chaining envelopes, which the Quadra requires for that sort of voodoo. Here's my take. The MiniBrute 2 is capable of sending and receiving Eurorack clock pulses. I would expand it based around that functionality. I would consider three modules initially: Expert Sleepers Disting mk4, Ornaments & Crime, and Temps Utile. All of the modules are multifunctional. This will give you a wide palette of options to augment your brute with. As you learn these three modules, you'll get a better taste for what direction you want to go with your expansion. O&C and TU are available in micro 8HP formats. That will go a long way in a cramped case. You're looking at less than $700US for the lot if you shop around. There are tons of videos on these modules on Youtube if you choose to go that way. The ErbeVerb is tasty. You will always want a good reverb. If you have the budget get that too. Once you feel you've mastered these modules, you'll be in good shape to decide what's next. If you find yourself using a specific feature of one module over and over... you might want to find a dedicated version. For example the Disting and the O&C have quantizers. If you're always using a quantizer then it might be prudent to get a stand-alone module.